Phil and his brill team at Karma Creative helped re-design and breathe new life in to a lack-luster, simple off-the-shelf website I’d been using for a few years. From the beginning of working with Karma they always spent time listening to exactly what I wanted and provided design options which right from the start fitted the requirements. Communication throughout the design, develop and implementation process was forthcoming and clear. I was always made welcome to pop into the office and see where things were up to and to talk through design actions. I made a lot of last-minute changes and additions but Pierre & Sammi were always willing to accommodate my requests! The on-going domain management and support when needed has been brilliant and the bespoke back-end interface I use now to amend the website is so much simpler. I can’t recommend Karma Creative enough and look forward to working on a new website project with the team next year. 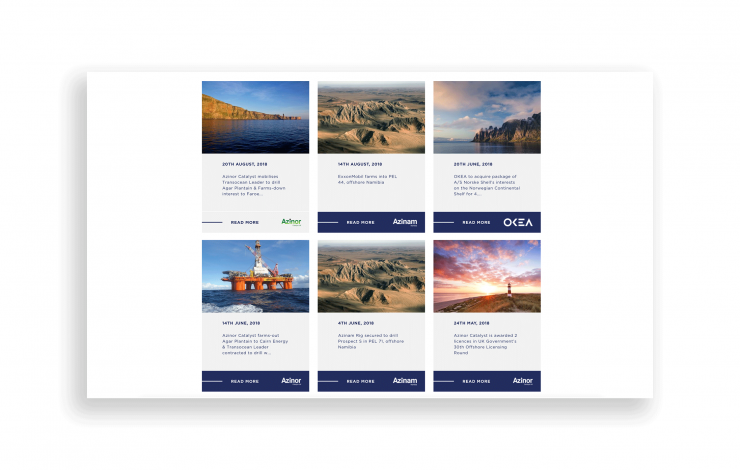 Azimuth is an upstream oil and gas offshore portfolio management company formed by Seacrest Capital Group, an energy focused private equity firm. Azimuth creates value by leveraging its technical expertise and commercial acumen with effective and efficient decision-making, generating leading acreage positions, coupled with a global network of excellent industry and government relationships.